The ability to conveniently and rapidly profile a diverse set of proteins has valuable applications. In a step toward further enabling such a capability, we developed the use of rolling-circle amplification (RCA) to measure the relative levels of proteins from two serum samples, labeled with biotin and digoxigenin, respectively, that have been captured on antibody microarrays. Two-color RCA produced fluorescence up to 30-fold higher than direct-labeling and indirect-detection methods using antibody microarrays prepared on both polyacrylamide-based hydrogels and nitrocellulose. Replicate RCA measurements of multiple proteins from sets of 24 serum samples were highly reproducible and accurate. In addition, RCA enabled reproducible measurements of distinct expression profiles from lower-abundance proteins that were not measurable using the other detection methods. Two-color RCA on antibody microarrays should allow the convenient acquisition of expression profiles from a great diversity of proteins for a variety of applications. Recent reports have shown the feasibility and value of antibody microarrays for the highly multiplexed analysis of proteins in biological samples [1–11]. The ability to rapidly and reproducibly measure multiple proteins in biological samples is clearly valuable both for the better understanding of biology and for the development of improved clinical diagnostics. Despite the great interest in chip-based protein assays, the routine application of antibody microarrays to biological research has yet to be broadly established. Significant effort is now underway to develop robust platforms that can be used for a variety of research areas and that produce consistent, reliable results. We present a step toward the development of such a platform. 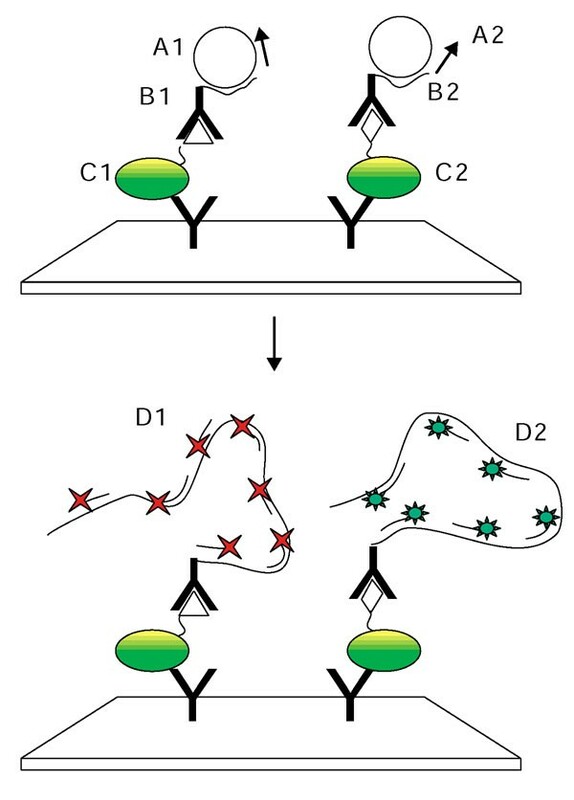 Two major types of antibody microarray detection systems have emerged: sandwich assays, which employ a matched pair of antibodies specific for every protein target; and label-based detection, which uses covalently attached tags, such as biotin or the fluorophores Cy3 and Cy5, on the target proteins to enable detection after proteins bind to the array. Sandwich assays can provide both high sensitivity and high specificity and have been effectively demonstrated in the parallel measurements of low-abundance cytokines in culture supernatants and body fluids [3, 10]. Label-based detection is an attractive complementary alternative to the sandwich assay. An advantage of label-based detection is ease in assay development. As only one antibody per target is required, as opposed to a pair of antibodies for a sandwich assay, it is easier to obtain and test antibodies to a broad diversity of proteins, and the expansion of an antibody array to accommodate new antibodies is straightforward. In addition, multicolor fluorescence detection is made possible when the targeted proteins are labeled. As different samples may be labeled with different tags, a reference sample may be co-incubated with a test sample to provide internal normalization to account for concentration differences between spots. The two-color strategy is broadly used in DNA microarray experiments and has been used in antibody microarray experiments to detect multiple proteins in serum [1, 7], cell culture [5, 8, 12] and tissue lysates . While label-based detection is accurate and reproducible in the analysis of higher-abundance proteins, the detection sensitivity has not been sufficient to reliably detect lower-abundance proteins in biological samples using current methodology. The lack of signal amplification, as in methods such as enzyme-linked immunosorbent assay (ELISA), is a major cause of the lack of sensitivity . A method to amplify the signal from labeled proteins would enhance the sensitivity of the direct-labeling format and expand its usefulness for a broad range of biological applications. Rolling-circle amplification (RCA) has been used for sensitivity enhancement in DNA quantitation , DNA mutation detection [15, 16], and array-based sandwich immunoassays [3, 17]. RCA is well suited for planar, multiplexed assays as the covalently attached amplified product cannot diffuse away. Also, the isothermal amplification process used in RCA preserves the integrity of the antibody-antigen complexes. To take advantage of these features for our antibody microarray assay, we investigated whether RCA could be adapted to provide sensitivity enhancement in a label-based detection, two-color antibody microarray assay. Such an approach would combine the advantages of the direct-labeling format, such as flexibility, expandability and multicolor detection, with the high sensitivity afforded by RCA. We therefore developed the use of RCA to detect labeled proteins from two different samples captured on antibody microarrays. Two-color RCA was applied to the measurement of multiple proteins from two different sets of serum samples using microarrays prepared on both polyacrylamide-based hydrogels and nitrocellulose. Two other label-based methods - direct labeling (the attachment of fluorescent dyes directly to analyze proteins) and indirect detection (the attachment of biotin and digoxigenin tags to analyze proteins followed by detection using dye-labeled secondary antibodies) were also used to analyze the serum samples, and the accuracy, reproducibility and sensitivity of the methods were compared. These experiments allowed a full evaluation of the performance of two-color RCA for serum-protein profiling. We developed and evaluated a method (termed two-color RCA) to amplify fluorescence signals by RCA from two populations of proteins captured on antibody microarrays (Figure 1). Two pools of proteins, representing a test sample and a reference sample, are covalently labeled with biotin and digoxigenin, respectively, and incubated together on an antibody microarray. After the labeled proteins bind to immobilized antibodies according to their specificities, antibodies targeting the biotin tag and the digoxigenin tag are incubated on the microarray. The anti-biotin and anti-digoxigenin antibodies each are covalently conjugated to 'primer 1' and 'primer 4.2', respectively. Two types of circular DNA, one with a portion complementary to primer 1 and another with a portion complementary to primer 4.2, hybridize to their respective primers, and DNA polymerase extends the primers by traveling repeatedly around the circular DNA template. Oligonucleotide 'decorators', complementary to the repeating extended strand from primer 1 or primer 4.2 and labeled with Cy3 or Cy5, respectively, are hybridized to the extended fragments, resulting in signal amplification in two colors. Schematic representation of two-color RCA on antibody microarrays. Two pools of proteins are respectively labeled with digoxigenin (C1, digoxigenin-labeled protein, digoxigenin represented by the triangle) and biotin (C2, biotin-labeled protein, biotin represented by the diamond). Primer 4.2-conjugated anti-digoxigenin (B1) and primer 1-conjugated anti-biotin (B2) bind to captured proteins, followed by hybridization of circle 4.2 (A1) and circle 1 (A2). Polymerase extends the primers using the circles as templates. Cy5-labeled oligonucleotides (D1), complementary to the extended DNA from primer 4.2, and Cy3-labeled oligonucleotides (D2), complementary to the extended DNA from primer 1, are hybridized to the extended DNA strands, producing signal amplification in two colors. We observed no cross-reactivity between the two circle types and the opposing primers nor between the two decorator types and the opposing extended strands under our incubation conditions (data not shown). We also examined the cross-reactivity between the RCA antibodies and the capture antibodies or the biotin and digoxigenin labels. Serum samples labeled with biotin were incubated on antibody microarrays and detected by RCA using only anti-digoxigenin antibodies and the corresponding decorators, and serum samples labeled with digoxigenin were incubated and detected by RCA using only anti-biotin antibodies and the corresponding decorators. 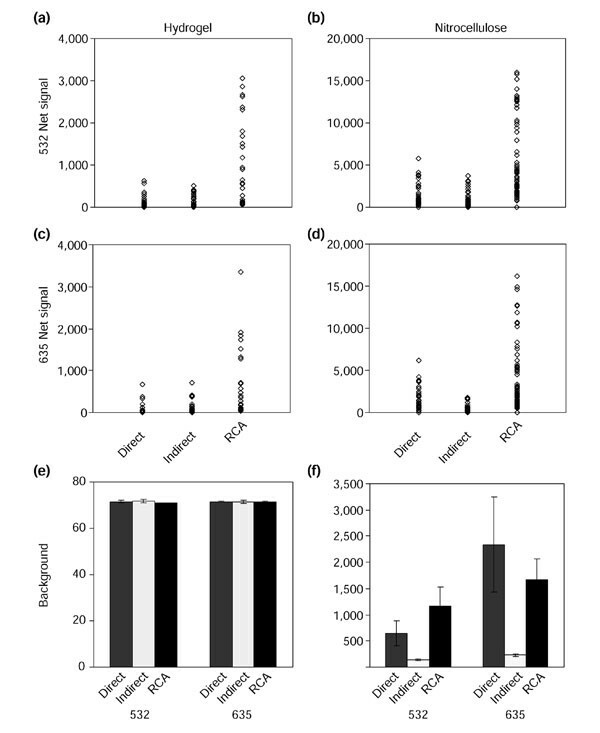 Among the 56 capture antibodies tested, none exhibited reactivity with the anti-biotin or anti-digoxigenin antibodies when using the hydrogel substrate, and five antibodies showed some reactivity with the anti-digoxigenin when using the nitrocellulose substrate (data not shown). Those antibodies were excluded from subsequent experiments. The signal amplification from the use of RCA was evaluated by comparison with direct labeling and indirect detection of multiple proteins from two different serum samples. Each serum sample was measured against itself as the reference using antibody microarrays prepared on both hydrogels and nitrocellulose. Experiments were performed in duplicate. Representative images (Figure 2) from the 24 arrays showed the relative signal strengths and background levels. 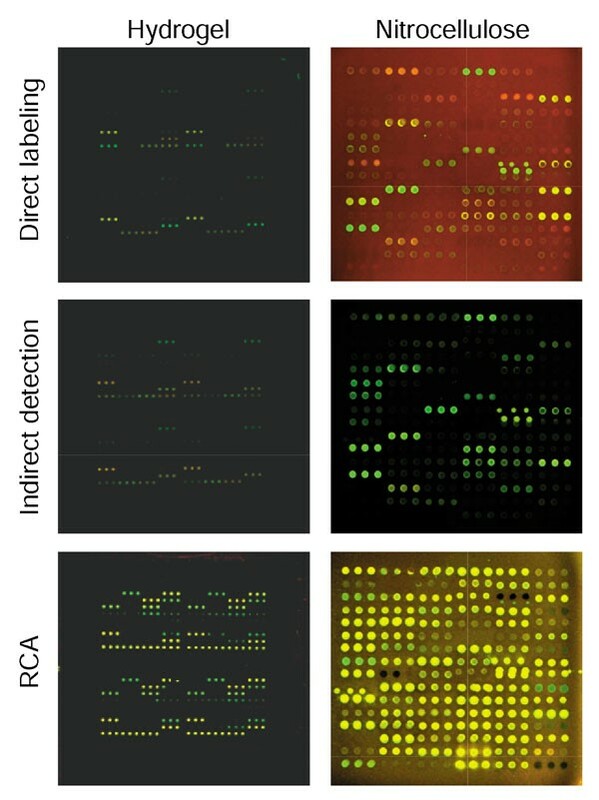 The fluorescence signals from microarrays detected with RCA were significantly higher than those detected with either direct labeling or indirect detection, and some antibody spots seem to be visible only with RCA detection. The background-subtracted fluorescence (averaged over the four experiments for each condition) of each antibody was plotted for each condition (Figure 3a,b,c,d). In each color channel, and on each substrate, the signal intensities from RCA are significantly higher than those from the other two methods. Per antibody, the increase ranged from twofold up to 30-fold on both substrates. Several antibodies produced measurable signal (that is, surpassing the threshold defined in the Materials and methods section) only using RCA. Representative images of antibody microarrays. A serum sample was incubated on antibody microarrays prepared on hydrogels (left) and nitrocellulose (right) and detected with direct labeling (top), indirect detection (middle), and RCA (bottom). The same serum sample was used in each color channel for each experiment. Scanner settings were identical within microarrays performed on the same substrate. Net signal intensities and backgrounds. Serum samples were incubated on antibody microarrays prepared on hydrogels and nitrocellulose and detected with direct labeling, indirect detection, and RCA. Two different serum samples were measured in duplicate for each condition, using the same serum sample in both color channels (635 and 532). The net signal is the background-subtracted, median intensity of each antibody spot, averaged over the four replicate experiments. Scanner settings were identical within microarrays performed on the same substrate. (a-d) The distribution of average background-subtracted intensities of the antibody spots for the indicated substrates, color channels and detection methods. (e, f) The average background levels for each detection method and substrate. The variation between the detection methods in background intensity was different for the two substrates (Figure 3e,f). On the hydrogel substrate, the background intensity did not change between detection methods (Figure 3e). On the nitrocellulose substrate, the background was lowest using indirect detection and was similar between direct detection and RCA (Figure 3f). Thus the variation in signal relative to background was also different between the substrates. On the hydrogels, RCA produced the highest signal relative to background, with the other detection methods similar to each other. On the nitrocellulose, indirect detection and RCA had similar signal levels relative to background, as RCA had higher signals but also proportionately higher backgrounds than indirect detection. Direct labeling on nitrocellulose had the lowest signals relative to background, and that method was not tested further. Having established that two-color RCA provided significant signal amplification in both color channels, it was important to evaluate the method's reproducibility, accuracy and sensitivity in applications using clinical samples. The performance of two-color RCA, indirect detection and direct labeling were compared in a series of experiments profiling proteins in a set of 24 serum samples; each experiment was performed in duplicate using antibody microarrays prepared on nitrocellulose. The nitrocellulose substrate was chosen because of more consistent print quality and overall better signal strengths compared to the hydrogel surface. The levels of the proteins von Willebrand factor, IgG, and IgA were also measured in each sample by ELISA. The reproducibility of the antibody-microarray measurements was evaluated by calculating the Pearson correlation between measurements from duplicate sets of 24 microarrays. 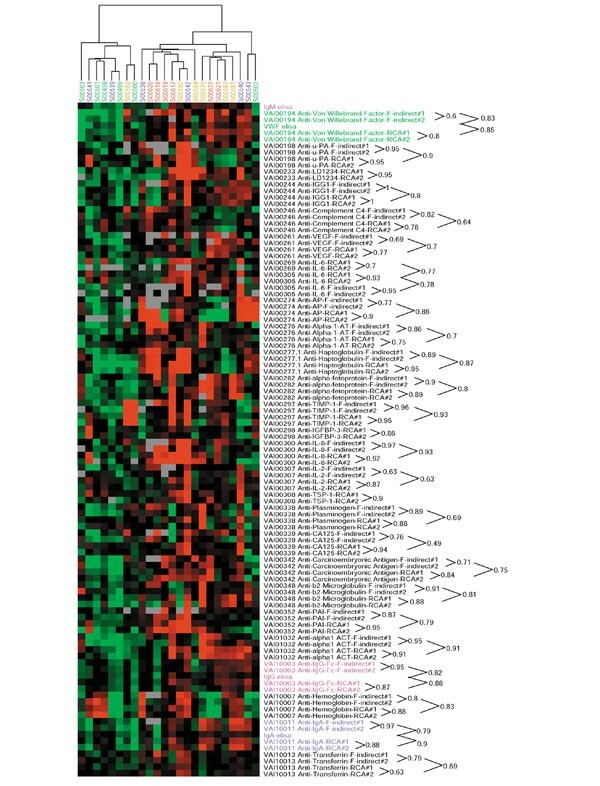 A visual representation of the reproducibility is provided by a cluster (Figure 4) in which replicate sets of microarray measurements from each antibody were placed in adjacent rows, with the correlation between the duplicate sets indicated to the right of the antibody names. Each of the 24 columns represents data from a serum sample over the replicate experiment sets, and the columns were clustered by similarity in expression of all the proteins. The pattern of measurements across the 24 samples is highly consistent between replicate experiments within each antibody, both for the duplicate RCA sets and the duplicate indirect-detection sets. The duplicate RCA sets had correlations similar to those from indirect detection. For example, both the RCA duplicate measurements and the indirect-detection duplicate measurements of anti-urokinase-like plasminogen activator (anti-uPA) had correlations of 0.95. Other antibodies showed more variation between the detection methods, but in general no clear advantage in reproducibility was observed for either method. Cluster of RCA and indirect-detection measurements. Twenty-four serum samples were incubated in duplicate on unique antibody microarrays prepared on nitrocellulose and detected with either RCA or indirect detection. Replicate experiment sets from each antibody are grouped in adjacent rows, and the correlations between adjacent rows are indicated to the right of the labels. The 24 columns, representing the data from each serum sample over the replicate experiment sets, were clustered by similarity in expression of all the proteins. The color of the column label indicates the clinical category of the patient from which the serum sample was taken: red, liver cancer; brown, cirrhosis; blue, pre-cirrhosis; green, healthy. Independently collected ELISA data are included for the proteins von Willebrand factor, IgA, and IgG (labels highlighted). The data were median centered in the row dimension, and the color and intensity of each square indicates the expression relative to other data in the row: red, high; green, low; black, medium; gray, missing data. The cluster also showed that the RCA measurements agreed very well with both the indirect-detection measurements and with the ELISA measurements. The correlations between the average RCA measurements and the average indirect-detection measurements (indicated by the outer numbers on the right of Figure 4) are similar to the correlations within each detection method, sometimes slightly less. Most correlations between the detections methods are 0.7-0.8, and several are above 0.9. The independently collected ELISA measurements of three of the proteins are also included in the cluster. Both the RCA measurements and the indirect-detection measurements substantially agree with the ELISA values, with correlations in the 0.8-0.9 range. The expression patterns of the antibodies were distinct from each other, consistent with the binding of distinct, specific components of the serum. The samples from patients with liver cancer or cirrhosis showed generally higher levels of most proteins as compared to the samples from healthy controls, although the samples from similar disorders do not co-cluster, indicating that the pattern of measurements from these proteins is not specific for a particular disease state. Some antibodies in the cluster have only RCA measurements included in the cluster, such as one of the anti-IL-6 antibodies, anti-IGFBP-3, and anti-TSP-1. These antibodies produced measurements for fewer than half of the samples using indirect detection, and those measurements were not included. The relative detection sensitivity of RCA and the other detection methods is in part indicated by the range of protein measurements enabled by each method, and a more sensitive method should enable measurements of a greater number of proteins in a greater number of samples. In three sets of experiments comparing RCA to either direct labeling or indirect detection, the number of serum samples out of a set of 24 (averaged over duplicate experiment sets) in which protein binding was measurable (that is, surpassing the threshold defined in the Materials and methods section) was summed for each antibody (Figure 5). In the first set (Figure 5a), serum proteins from liver cancer, cirrhotic and pre-cirrhotic patients and controls were measured by both RCA and direct-labeling detection using antibody microarrays printed on the hydrogel substrate. The second set (Figure 5b) was identical to the first but compared RCA to indirect detection instead of direct-labeling detection. And the third set (Figure 5c) was identical to the second but used microarrays printed on nitrocellulose instead of hydrogels. Number of samples yielding measurable data for each antibody. RCA (gray bars) was compared to either direct labeling or indirect detection (dark bars) in the measurement of 24 serum samples in duplicate. For each antibody, the number of samples producing measurements above the detection threshold (as defined in Materials and methods) was summed and averaged over the duplicate experiment sets (see Table 1 for antibody IDs and summary of correlations between replicate experiment sets). (a) RCA compared to direct labeling on hydrogels using samples from liver cancer patients and controls. 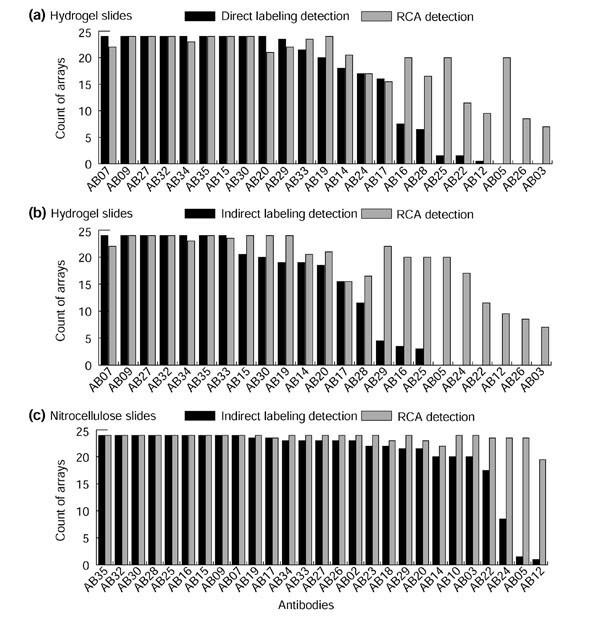 (b) RCA compared to indirect detection on hydrogels using samples from liver cancer patients and controls. (c) RCA compared to indirect detection on nitrocellulose using samples from liver cancer patients and controls. For each antibody, the correlation between replicate sets of 24 microarrays is given, both for RCA and for direct labeling or indirect detection. The correlation is the Pearson correlation in the overlap between the sets, that is, using only samples for which measurements were available in both sets. Correlations were not calculated if the overlap between the duplicate sample sets was less than three samples or less than half the samples from one of the sets. Asterisk, not a statistically significant correlation, using a 99% confidence level based on the size of overlap between sets. In each comparison, RCA detection resulted in an increased number of measurements for several different antibodies (see Table 1 for antibody identities). Antibodies targeting higher-abundance proteins (for example, AB07 (anti-IGG1), AB14 (anti-alkaline phosphatase), AB33 (anti-hemoglobin), AB34 (anti-IgA), and AB35 (anti-transferrin)) produced measurements in all the samples in each condition and detection method. Antibodies that always produced more measurements when using RCA generally targeted lower-abundance proteins (for example, AB03 (anti-urokinase-like plasminogen activator), AB05 (anti-lactate dehydrogenase 1, 2, 3 and 4), AB12 (anti-IL-6), and AB22 (anti-IL-6)). The measurements gained by RCA also were highly reproducible. In the data from Figure 5c and Figure 4, the antibodies AB03, AB05, AB12, and AB22, which each resulted in significantly more measurements with RCA, produced inter-set correlations of 0.95, 0.95, 0.7, and 0.93, respectively. A full comparison of the inter-set correlations is presented in Table 1. Comparisons of data from some antibodies were not possible in certain sets if not all arrays within a batch were printed consistently, as noted in Table 1. Difficulties in consistent printing were especially experienced when using a contact printer on the hydrogel substrate. This work was motivated by our earlier experience with the use of antibody arrays to detect fluorophore-labeled proteins in serum samples . We found that while direct fluorophore labeling performed well in the detection of higher-abundance proteins, the sensitivity was not sufficient to allow measurements of many potentially useful and interesting mid- to low-abundance proteins. We recognized the fundamental advantages of label-based detection, namely the ease of assay development for new targets and the requirement for only one antibody per target, as compared to two for sandwich assays. Therefore, we sought methods to improve the sensitivity of detection of labeled proteins. RCA was a good method to test for this purpose. RCA, in contrast to certain enzymatic or chemiluminescent amplification methods, could be readily adapted to produce signal amplification in two color channels, which was important to allow the co-incubation of a reference sample on the arrays. Also, the extended DNA strand produced by RCA is covalently attached to the detecting antibody, so the amplified fluorescent signal cannot diffuse away. This feature is critical in a planar format with distinct assays in neighboring spots. We first established that RCA was in fact providing significant fluorescence enhancement in two colors. The net fluorescence intensities from RCA were significantly greater, up to 30-fold, than those from direct labeling or indirect detection on both substrates, and some antibodies produced measurable signal only when using RCA. This signal increase is less than the up to 1,000-fold increase reported previously  in amplifications of tethered primers. This lower level of observed amplification could be because we were amplifying from an antibody-antigen-detection antibody complex, which might partly dissociate in the increased steps and washes used in RCA as compared to non-RCA, or because the complex might not be as amenable to amplification as the tethered primer. Also, we were comparing to multiply labeled proteins and antibodies, which would reduce the relative increase observed with RCA. Other publications describing the use of RCA for immunoassays did not report a quantitative comparison of amplified versus nonamplified fluorescence, but one reported an approximate two orders of magnitude reduction in detection limits compared to conventional ELISAs . The background level varied between detection methods when using the nitrocellulose substrate, but not when using the hydrogels. The hydrogel substrate is apparently so resistant to nonspecific protein binding that the background is at a minimum and is unaffected by changes in label concentrations in the samples. The nitrocellulose more readily binds proteins nonspecifically, as was reflected in the difference between the detection methods in background levels. Indirect detection had the lowest background levels on nitrocellulose as the fluorophore concentration was lowest. As the net signal levels from indirect detection were similar to those from direct labeling, indirect detection was better than direct labeling on the nitrocellulose. RCA, by comparison to indirect detection, amplified both the background and signals. Although the background was amplified also, the higher net signal from RCA still improved the detection of low-abundance proteins. With any amplification method it is important to confirm reproducibility, accuracy, and lack of introduction of systematic bias. The amplification process in general did not have a negative effect on reproducibility, as the correlations between replicate RCA measurements and between replicate indirect detection measurements were very similar. The fact that RCA and indirect detection measurements correlated with each other also indicated that the amplification process did not introduce systematic error. The agreement of both types of measurements with ELISA measurements indicated that, at least for those proteins tested, the results were accurate. The accuracy of the microarray measurements may also be inferred from the distinct expression profiles obtained from each antibody, which are consistent with the binding of specific and distinct components of the serum samples. In addition, the rise in abundance of several different proteins in association with disease is consistent with many previous observations, further supporting the accuracy of the measurements. We assessed whether the amplified signal demonstrated in Figures 2 and 3 translated into the ability to detect a greater number of proteins in a greater number of samples. The percentage of samples in which proteins are measurable is a good indicator of a detection method's sensitivity relative to the concentration range of a protein. In three separate comparisons of RCA to either direct-labeling or indirect-detection methods and on either hydrogel or nitrocellulose substrates, the use of RCA yielded measurements from an increased number of samples for multiple antibodies. The new measurements afforded by RCA were highly reproducible and had distinct expression patterns, as shown in the cluster of Figure 4. Also, the measurements gained were of lower-abundance proteins normally outside the detection limit of the direct-labeling method. The repeated demonstration under a variety of conditions of an increased number of distinct and reproducible measurements of lower-abundance proteins is strong evidence that two-color RCA does in fact improve the detection sensitivity of the antibody microarray assay. The actual quantified detection limits vary according to the antibody used and are difficult to measure without known standards to construct calibration curves. The detection limits can be estimated on the basis of the known concentration ranges of the target antigens. For example, IL-6, which was measurable to a greater extent by RCA as compared to indirect detection or direct labeling, is typically present in the serum at concentrations of 0.001-100 ng/ml, which gives some indication that two-color RCA may be able to detect antigens in the low-to-mid pg/ml range. Previous use of RCA in chip-based sandwich immunoassays reported detection limits below 1 pg/ml , showing that sandwich immunoassays have the potential for very low detection limits. We have not carried out a direct comparison of detection limits between two-color RCA and sandwich one-color RCA. Here we present early investigations, and further optimization could further reduce detection limits and improve the applicability of the method. It will be interesting to test alternative protein-labeling strategies, such as the use of cisplatin derivatives to label cysteine, methionine, and histidine groups , as the labeling of certain proteins through the surface amine groups may interfere with antibody binding. The alternative labeling strategy may provide better detection of certain proteins and worse detection of others. Another task for optimizing the application of this technology will be to define the linear response range for the various protein targets. The reduction of detection limits by RCA shifts the linear response range of the assay to lower concentrations, and various proteins will be measured optimally at different serum dilutions. We are now in the process of determining the effect of protein concentration and serum dilution on the measurement characteristics of each antibody. We now have a convenient method for probing a wide range of proteins in a flexible and rapidly customizable assay. This method represents a valuable complement to the sandwich format. While the potential for fine specificity is sacrificed when using one antibody instead of two, a great diversity of antibodies and novel targets may be probed rapidly, perhaps enabling the acquisition of broader, as opposed to more specific, information. As new potential protein markers are identified through RNA expression profiling and other methods, it will be important to expeditiously test each protein both alone and in combination with other potential markers. In addition, the increasing knowledge of the protein composition of serum and plasma  compels exploration of the variation of these proteins in the population and as a function of disease. The ability to undertake such explorations, potentially enabled by the method presented here, should be valuable for basic and applied research applications. A set of 24 serum samples, collected at the University of Michigan Hospital, consisted of samples from six liver cancer patients, six pre-cirrhotic patients, six cirrhotic patients, and six normal controls. All samples were stored frozen at -80°C and had been thawed no more than three times before use. All samples were collected under protocols approved by local Institutional Review Boards for human subjects research. Antibodies were purchased from various sources. A list summarizing the sources, catalog numbers, and other information about the antibodies is provided in the supplementary information at reference . Antibodies that were supplied in ascites fluid or antisera were purified using Protein A beads (Affi-gel Protein A MAPS kit, Bio-Rad) according to the manufacturer's protocol. Samples (10-15 μl each) of 100-2000 μg/ml antibody solutions in 1x PBS were prepared in polypropylene 384-well microtiter plates (Genetix). Two types of machines, a custom-built robotic microarrayer and a piezo-electric non-contact spotter (Biochip Arrayer, PerkinElmer Life Sciences), transferred small amounts of each antibody solution to the surfaces of coated microscope slides. Antibodies were deposited six to eight times each onto slides coated with either a polyacrylamide hydrogel (HydroGel, PerkinElmer Life Sciences) or nitrocellulose (FAST slides, Schleicher & Schuell). Before printing, the hydrogel-coated slides were treated as described . The slides were washed for 10 min each in three changes of purified water, dried by centrifugation, and incubated at 40°C for 20 min. The nitrocellulose-coated slides needed no pretreatment before printing. Each printed microarray was circumscribed using a hydrophobic marker PAP pen, leaving about 3 mm between the array boundary and the hydrophobic border. The nitrocellulose-coated slides were blocked overnight at 4°C in 1x Tris-buffered saline (TBS) with 1% BSA and 0.1% Tween-20 (TBST0.1), then briefly rinsed with 1x PBS/0.5% Tween-20 (PBST0.5) before use. The hydrogel-coated slides were incubated overnight at room temperature in a humidified chamber to allow the antibodies to bind to the hydrogel matrix. They were washed for 30 sec, 3 min and 30 min in 1x PBS with 0.5% Tween-20 (PBST0.5), blocked for 1 h at room temperature in 1% BSA/PBST0.5, and washed briefly two times in PBST0.5 before use. For one group of experiments, an aliquot from each of 24 serum samples was labeled with Cy3 (Amersham), and another aliquot was labeled with Cy5 (Amersham). Each serum aliquot was diluted 1:15 with 50 mM carbonate buffer at pH 8.3, and 1/20 volume of 6.7 mM N-hydroxysuccinimide (NHS) ester-linked Cy3 or Cy5 (Amersham) in DMSO was added. After the reactions had proceeded for 2 h on ice, 1/20 volume of 1 M Tris-HCl (pH 8.0) was added to each tube to quench the reactions and the solutions were allowed to sit for another 20 min. The unreacted dye was removed by passing each solution through a size-exclusion chromatography spin column (Bio-Spin P6, Bio-Rad) with a molecular weight cutoff of 6,000 Da. The Cy5-labeled samples were pooled, and equal amounts of the pool were transferred to each of the Cy3-labeled samples. Each dye-labeled protein solution was supplemented with non-fat milk to a final concentration of 3%, Tween-20 to a final concentration of 0.1%, and 1x PBS to yield a final serum dilution of 1:100. For the other experiment sets, one aliquot from each of 24 serum samples was labeled with NHS-digoxigenin (Molecular Probes), and another aliquot was labeled with NHS-biotin (Molecular Probes). The labeling procedure was identical to that described above. The digoxigenin-labeled samples were pooled and distributed among the biotin-labeled samples prior to the addition of non-fat milk, Tween-20 and PBS in the same proportions as above. A 100 μl sample of each labeled serum sample mix was incubated on a microarray with gentle rocking at room temperature for 2 h. The microarrays were rinsed briefly in PBST0.1 to remove the sample, washed three times for 10 min each in PBST0.1, and dried by centrifugation. Microarrays that had been incubated with Cy3/Cy5-labeled samples were ready for scanning. Microarrays that had been incubated with biotin/digoxigenin-labeled samples were processed for either indirect detection or RCA detection. For indirect detection, the microarrays were incubated under gentle rocking for 1 h at room temperature with Cy3-labeled anti-biotin and Cy5-labeled anti-digoxigenin antibodies, each prepared at 0.5 μg/ml in 1x PBST0.1 with 1% BSA. The antibodies were labeled according to the labeling protocol above. After three room-temperature washes under rocking for 10 min each in PBST0.1, the microarrays were ready for scanning. The following reagents specific for RCA detection were kindly provided by Molecular Staging (New Haven, CT): anti-biotin antibody covalently conjugated to a 20-base oligonucleotide (primer 1); anti-digoxigenin antibody covalently conjugated to a different 20-base oligonucleotide (primer 4.2); 81-base circular DNA (circle 1) with a portion complementary to primer 1; and 80-base circular DNA (circle 4.2) with a portion complementary to primer 4.2 (the sequences of the primers, circles and decorators can be found in the supplementary information at ref ). The microarrays were incubated for 1 h at room temperature with a solution containing 75 nM circle 1, 75 nM circle 4.2, 1.0 μg/ml primer 1-conjugated anti-biotin, and 1.0 μg/ml primer 4.2-conjugated anti-digoxigenin in PBST0.1 with 1 mM EDTA and 5 mg/ml BSA. The microarrays were rinsed briefly in PBST0.1 and washed at room temperature with gentle rocking three times for 10 min each in PBST0.1. Phi29 DNA polymerase (TempliPhi, Amersham) in 1x Tango buffer (Fermentas, Hanover, MD) solution with 0.1% Tween-20 and 1 mM dNTPs was incubated on the arrays at 37°C for 30 min. The microarrays were rinsed briefly in 2x SSC/0.1% Tween-20, washed three times for 10 min each at room temperature with gentle rocking in 2x SSC/0.1% Tween-20, and dried by centrifugation. A Cy3-labeled 18-bp oligonucleotide (decorator 1) complementary to the repeating DNA strand from primer 1 and a Cy5-labeled 22-bp oligonucleotide (decorator 4.2) complementary to the repeating DNA strand from primer 4.2 were prepared at 0.2 mM each in 2x SSC with 0.1% Tween-20 and 0.5 mg/ml herring sperm DNA. This solution was incubated on the microarrays for 1 h at 37°C with gentle rocking. The microarrays were briefly rinsed in 2x SSC/0.1% Tween-20, washed three times for 10 min each at room temperature in 2x SSC/0.1% Tween-20, and dried by centrifugation. ELISA measurements were made according to protocols supplied with kits for IgM, IgG, IgA, and von Willebrand factor (Bethyl, Montgomery, TX). The microarrays were scanned (ScanArray, PerkinElmer Life Sciences) for fluorescence using laser excitation at 532 and 635 nm, and the program GenePix 4.0 (Axon Instruments) was used to quantify the images. An intensity threshold for each antibody spot was calculated by the formula 3 × B × CVb, where B is each spot's median local background and CVb is the average coefficient of variation (standard deviation divided by the average) of all the local backgrounds on the array. (This threshold is similar to the standard deviation of the local background but minimizes the effects from spikes in the local backgrounds.) For spots with fluorescence signal surpassing the threshold in both color channels, the ratio of background-subtracted median sample-specific fluorescence to background-subtracted median reference-specific channel fluorescence was calculated, and ratios from replicate antibody measurements within the same array were averaged. The resulting ratios were multiplied by a normalization factor for each array, N, that was calculated by N = (SIgM / μIgM) / RIgM, where RIgM is the average ratio of the replicate anti-IgM antibody spots on a particular array, SIgM is the ELISA-measured IgM concentration of the serum sample on that array, and μIgM is the mean ELISA-measured IgM concentration of all of the samples . Hierarchical clustering and visualization were performed using Cluster and Treeview  (see ). Ratios were log-transformed (base 2) and median centered (by genes), and antibodies that did not have measurements in at least 50% of the samples were removed. The following additional data files are provided with the complete version of this article, online: The net signals and backgrounds from the experiments on hydrogel slides used in figures 2 and 3 (Additional data file 1); the net signals and backgrounds from the experiments on nitrocellulose slides used in figures 2 and 3 (Additional data file 2); the averaged and normalized data used in figures 4 and 5C from set one of the indirect detection experiments (Additional data file 3); the averaged and normalized data used in figures 4 and 5C from set two of the indirect detection experiment (Additional data file 4); the raw ratios (not averaged or normalized) used in figures 4 and 5C from set one of the indirect detection experiments (Additional data file 5); the raw ratios (not averaged or normalized) used in figures 4 and 5C from set two of the indirect detection experiments (Additional data file 6); the averaged and normalized data used in figures 4 and 5C from set one of the RCA detection experiments (Additional data file 7); the averaged and normalized data used in figures 4 and 5C from set two of the RCA detection experiments (Additional data file 8); the raw ratios (not averaged or normalized) used in figures 4 and 5C from set one of the RCA detection experiments (Additional data file 9); the raw ratios (not averaged or normalized) used in figures 4 and 5C from set two of the RCA detection experiments (Additional data file 10); the Elisa values that were used for normalization of the data (Additional data file 11); the antibodies used in this study (Additional data file 12); and, finally, the sequences for the primers, circles and decorators used in this study (Additional data file 13). The files are also available at . We thank Molecular Staging, Inc., for kindly providing reagents and helpful suggestions. We thank Peterson Haak and Darren Hamelinck for assistance in preparation of the arrays. This work was supported by the Early Detection Research Network of the National Cancer Institute (grant UO1 CA084986 to B.B.H. ), the Michigan Proteome Consortium and the Michigan Economic Development Corporation (to B.B.H. ), the National Cancer Institute (grant CA81671 to P.L. ), a pilot project grant from the Yale Liver Center (grant P30 DK 34989 to P.L. ), and the Van Andel Research Institute (to B.B.H. ).